Uncle Tetsu Japanese Cheesecake — it's hung. By now most people in Toronto know about Uncle Tetsu cheesecake. Dan and I were first flagged about this bakery at Bay & Dundas at the beginning of March, a few weeks before it would actually open. We were walking by one day and noticed a new store front was opening up with a red banner in the front that said Uncle Tetsu Japanese Cheeseake coming soon! I wondered, “What the what the?! What is this Japanese Cheesecake that this banner alludes to?" 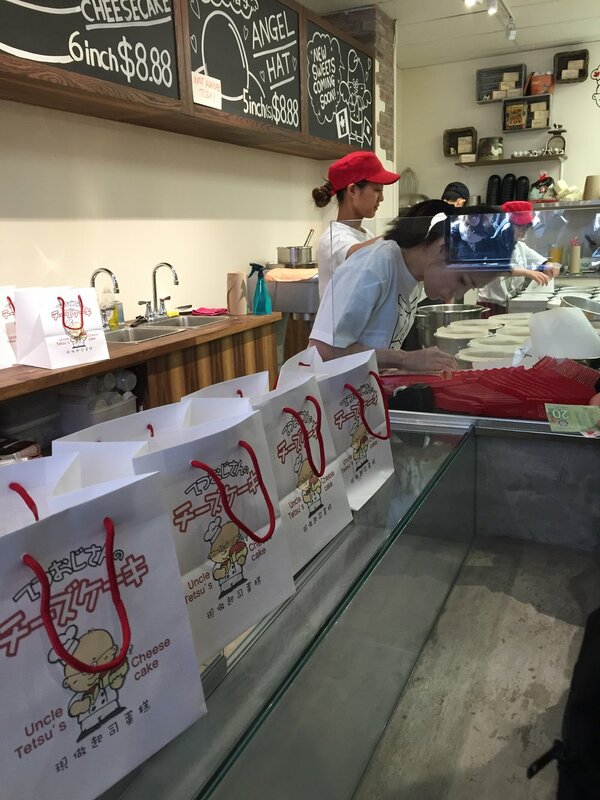 Uncle Tetsu has more 70 shops across China, Singapore, Thailand, Malaysia, Philippines and Cambodia! I was VERY intrigued by the light research that I did, and was pumped to try this Japanese cheesecake when the bakery opened. Looks like I wasn’t the only one excited, because BOOM - within the first week mayhem ensued at Bay & Dundas during its launch! First attempt to try Uncle Tetsu: FAIL! BUT knowledge is power! It opened on a Wednesday. I remembered having a day off that Friday so I thought, SWEET, I’ll just swing by the bakery in the day and pick me up a cheesecake. WRONG! I was out and about running errands all day and walked by the line 5 times and each time it looked ridiculously long! One of those times I decided to just stick it out and join the line, but within 5 minutes of being in the line I had to hop out because I overheard that it was CASH only and I never carry cash. UGH!! The following Saturday morning, Dan joins me in line at 10:40am and already there were people in line waiting for the 11am opening! We waited for 30 minutes to get the cheesecake, warm and fluffy straight out the oven. We raced home and tried it and mutually agreed, it was tasty, but it was overhyped by the length of the line and time people were willing to wait for. It was a nice, warm angel cake that had a hint of a cheesecake. It was nice! But I didn’t feel I needed to try it again. The next time I waited a significantly longer time for the cheesecake, over an hour! I was monitoring the line situation every time I walked by and it was not getting better, it was getting WORSE because the bakery was getting more press (i.e. BlogTO) and subsequently the line was getting longer and longer! The estimated wait time was now between 2-4 hours! I couldn’t get the taste of the light fluffy cake out of my mind, so I mentally committed to waiting in line for another one. Again, this time was another Saturday and I was there by 10:30am - but when I got there, there were a TON of people who were already there, and so I missed the first batch of release and had to wait for the next one. More on this later when I go through the details of their operation after casing the joint for weeks. After the second time from waiting for more than an hour I thought NO MORE, never again! I won’t be one of those chumps waiting in line for hours on end for this cheesecake. BUT - when I walked by one day around 9am to run an errand during my time off, I noticed that there were people outside. I thought WOW, people are waiting now at 9am when the bakery doesn’t open at 11am now? That’s a new level of commitment! But then I noticed people were moving and going into the store and I thought WHAAAAATTT, the bakery is open early now?! Well it turns out that morning was the first day they released their new open time: 7am! So I hopped in line and waited for about 25 mins and voila, another cheesecake to consume! Riding off the high of knowing I lived 5 mins away and that it opened up at 7am, a few days later I set my alarm for 6:55am. The next morning, the alarm sounded, I jumped out of bed and grabbed my running shoes and ran across the street for 7:05am. There were 3 people ahead of me in line. I was confused because I thought the store opened at 7am so why were they waiting outside? The first guy in line said that the bakery had issues, they had an initial bad batch and so everything was delayed by 20 mins. So I ended up waiting for 20 unexpected minutes but SO WHAT, I still got cheesecake in my hands and was back in the apartment early enough when Dan was just finished getting ready for work. Ok by the fourth time above I thought enough is enough Katy, you can’t keep organizing your life around cheesecake. So since then, I’ve stopped COLD TURKEY! I haven’t had one… in WEEKS! They have these madelines too that they sell but they’re not as good, so I won’t even waste time about the price of them, but I will note it’s max of 4 madelines per person. They have a TON of staff in the tiny storefront & bakery, which can’t be more than 700 square feet. Each and every time I’ve gone, there has been no less than 5 people in the shop standing around. The last time I was in there I observed 6 people behind the scenes, half of them standing around idly chitchatting. I’m actually confused why they have so many people in the background working the storefront when every single time I’ve gone there it seems like only half of them are working and the other half are giggling. They have 3 ovens stacked on top of each other, and this is what the cheesecake is baked in. They have a tray of 6 cheesecakes on each tray, and 2 of these trays fit perfectly into each of the oven. They will not sell any cheesecakes that aren’t baked perfectly. They will THROW IT OUT. The cheesecake takes 45 minutes to bake, but they don’t cook all 30-36 cheesecakes all at once. They stagger it by about 20 minutes apart - so really 10-12 cheesecakes are sold every 20 or so minutes. Which means if you’re the 30th person in line, you’ll be waiting for close to an hour. The line has improved since they changed their hours from 11am - 11pm to now 7am - 11pm. The line would go down the block all the way to the Greyhound bus station but with the earlier hours, I now see the line with about 40-50 people waiting which doesn’t seem TOO bad when before the line was consistently 100+ strong. Ok so now that you know all of the facts, Dan and I did a business case of what we predict are there estimates and their expenses. It was actually impressive all the variables we considered, and I would have posted about it except SOMEONE deleted the excel spreadsheet and lost all the data points we had!! *cough, cough* DAN! Essentially when you factor in all their expenses (all their staff, ingredients, equipment & ingredients, utilities, lease, etc) - we estimate their operating revenue after all of these expenses comes to $50k/month! And they’ve only been in business since mid March. Conclusion: I need to figure out how to get in on this Uncle Tetsu franchise!